MDM Landscapes offers experienced stone work in Dallas-Fort Worth, TX, as well as flagstone installation. Give our team a call at 817-396-0125. Natural stone is one of the most versatile and durable materials available for landscape design. Adding both texture and contrast, stone can make for excellent groundcover and is a welcome addition to almost any existing hardscape or landscape design. Flagstone (flat stones made of sandstone, feldspar, or quartz) pathways are functional, durable, and beautiful in any climate. They consist of natural stones arranged in a pleasant pattern and are leveled to ensure safety and comfort when in use. They can also be made from slate, limestone, bluestone, and other available materials depending on your location. 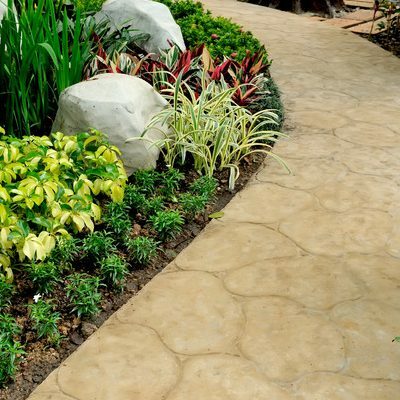 Flagstone pathways can be more expensive than alternative paving materials, but they offer durability and resistance that is unmatched. They’re easy to maintain and can withstand harsh weather and acids from fertilizers and soil. There are a variety of colors, patterns, finishes, and shapes available to match the existing aesthetic of your home and landscape. To get stone work and flagstone work in the DFW, call our team today! Flagstone comes in a wonderful variety of colors, making it ideal for custom hardscape designs. Since they are made from natural stone, the color will not fade quickly and can last much longer than other elements of your landscape. Some of the more common colors available include shades of red, blue, brown, green, and gray. In addition to a variety of colors, flagstone offers a multitude of different patterns such as basket weave or diamond patterns. There are random and irregular patterns and any combination is possible, making for an endless amount of possible custom themes! Flagstone is available in many different shapes, including square, rectangle, hexagonal, spectrum, diamond, and irregular. There are different selections for size and thickness to best suit your taste and needs. Thickness range is typically from 1 to 3 inches. Whatever you need, whether it’s a path leading from your business to your or a stone feature surrounding the pond or fountain at your apartment complex, MDM Landscapes is happy to help! We offer professional, reliable stone work in Dallas-Fort Worth, TX. Please call us today at 817-396-0125 if your commercial property, apartment complex, or residential development need flagstone installation service. Updated on March 6, 2019 at 3:07 pm by MDM Landscapes.